I’m sure I’m not the only one who still remembers the jingle that Bagel Bites used to use in their commercials: “Pizza in the morning, pizza in the evening, pizza at supper time. When pizza’s on a bagel you can have pizza any time.” But I think we can all agree that pizza doesn’t have to be on a bagel to be eaten any time of day. I fully own up to having eaten cold pizza for breakfast on occasion, and I know there’s others out there like me. I suppose that means that any pizza could be a breakfast pizza if you eat it for breakfast. But! This month’s pizza lab is not just a pizza that you happened to eat for breakfast. 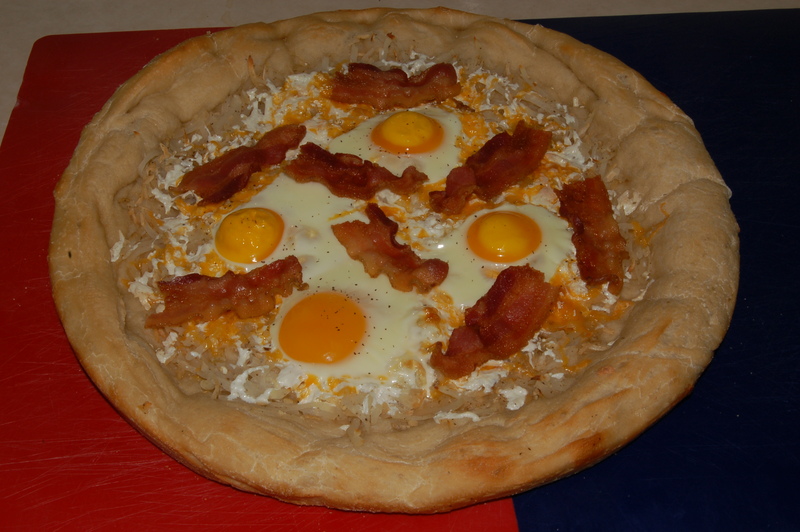 It is a breakfast pizza. We’ve seen breakfast pizzas other places before but they’re not really breakfast food pizzas. They’re more like brunch pizzas at best. 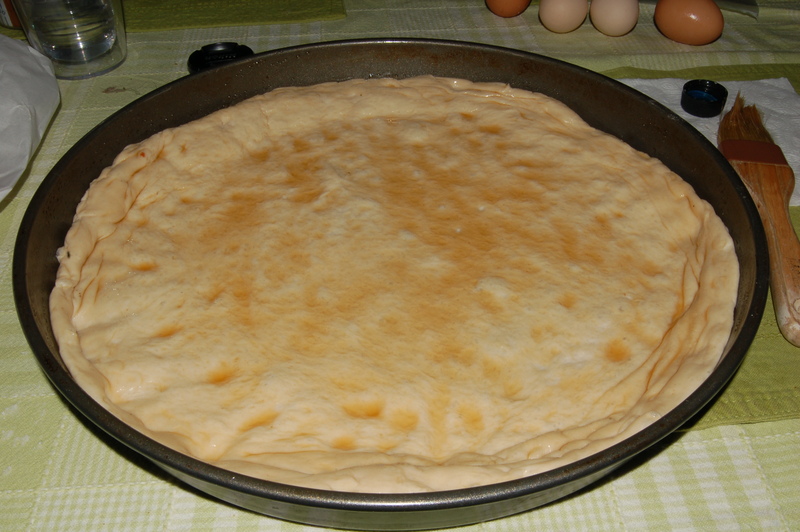 Most are more like flatbreads with some greens and cheese and maybe eggs on them. 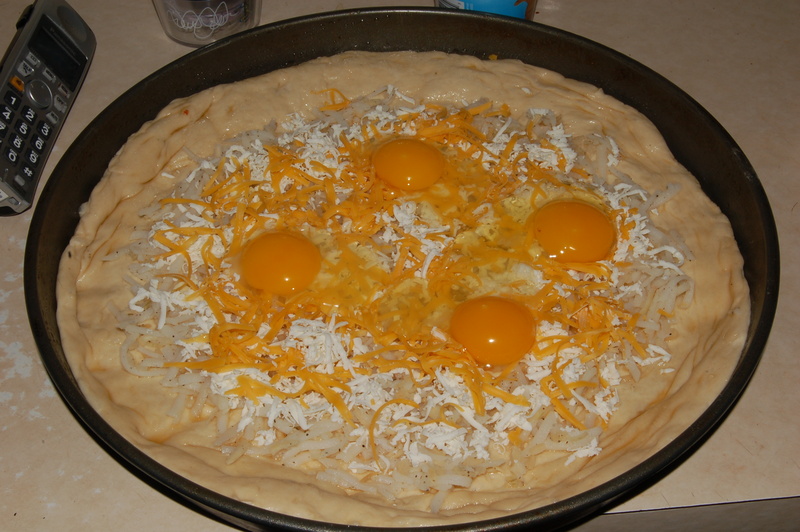 We wanted to make a breakfast pizza that was actually inspired by breakfast foods. Not stuff people pretend to like to eat for breakfast (spinach? No thank you…) but stuff people actually eat for breakfast (helloooo bacon). 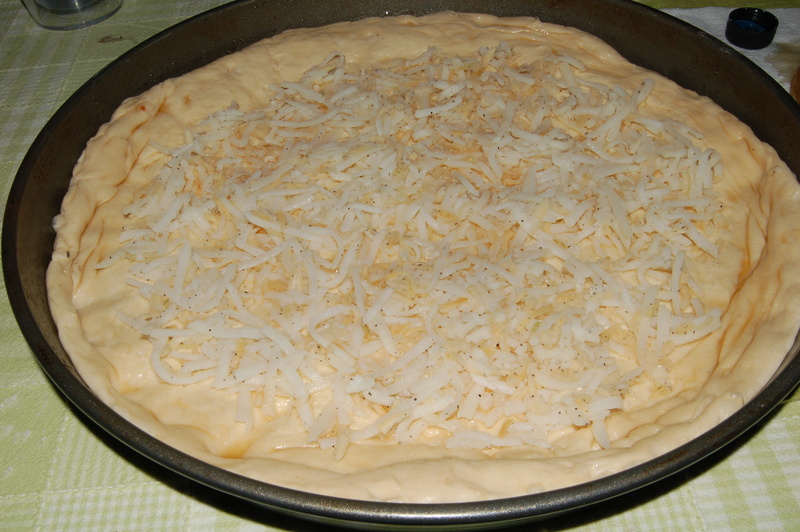 We tossed around the idea of putting pieces of pancake on top, but ultimately decided against it because that would essentially mean having bread on bread, and as we’ve learned from other pizzas, too much starch is not a good thing. Also because it might be too similar to another pizza we have in the pipeline. And since we’ve already tried Pancake Pizza, we decided it best to have the bottom crust filled in for the role of pancakes for this pizza. And what goes on top of pancakes? Maple syrup of course! So the crust got a nice brush down with maple syrup. Don’t we all want to get a nice brush down with maple syrup? The next breakfast food to get a spot on the pizza was the diner staple hash browns. For some people hash browns refer to potatoes that have been diced. And those people are wrong. Just kidding (mostly). But to me hash browns are shredded potatoes. Now that I think about it, they’re really kind of like free-form potato pancakes. And they’re delicious. You might not think putting potatoes on top of maple syrup would be a good idea, but maple syrup goes with pretty much all breakfast foods, so it worked. The only thing I would do different next time is pre-cook the hash browns at least a little bit so they get more brown and crispy like they are when made regularly. Normally we put cheese as the very top layer on our pizzas, but in this case we made an exception for reasons that will become clear as you scroll down. So we topped the hash browns with shredded cheddar and mozzarella cheeses. Next up: eggs. Eggs posed a bit of a problem. Scrambled eggs would have made for more even distribution among the slices, but would have certainly overcooked in the oven. That meant turning to sunny-side up eggs. They’re the classic image of an egg on a breakfast plate anyway, so that worked out well aesthetically. This is why we needed to hold off on the cheese. If we’d put it on top you wouldn’t have been able to see those sunny eggs looking up at you as easily I have to admit I was a bit nervous about just cracking a raw egg onto our pizza, but it worked out surprisingly well. 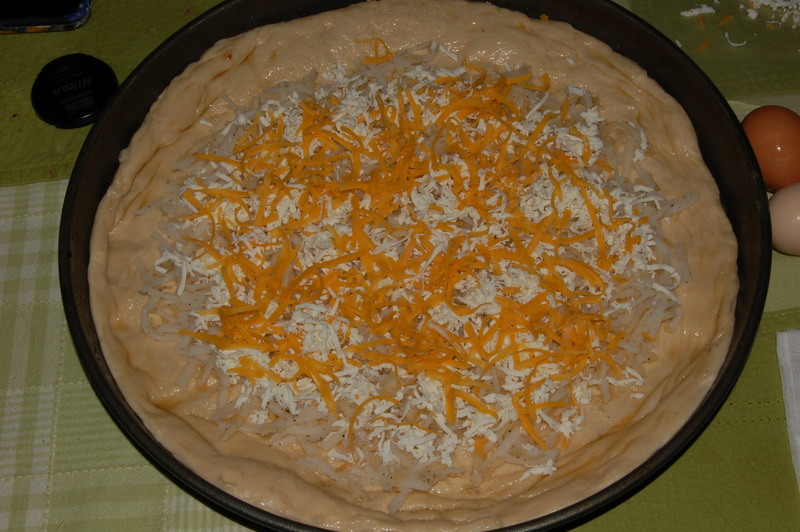 Once the eggs were on the pizza, it was time for it to head into the oven. We pre-cooked the bacon off the pizza first, because if we’d cooked it on the pizza all that fat that renders out would have been on the pizza. And we are anti-greasy pizzas here at PCFG. So we tossed the cooked strips of bacon onto the pizza in its last few minutes of cooking just to make sure it was nice and warm. 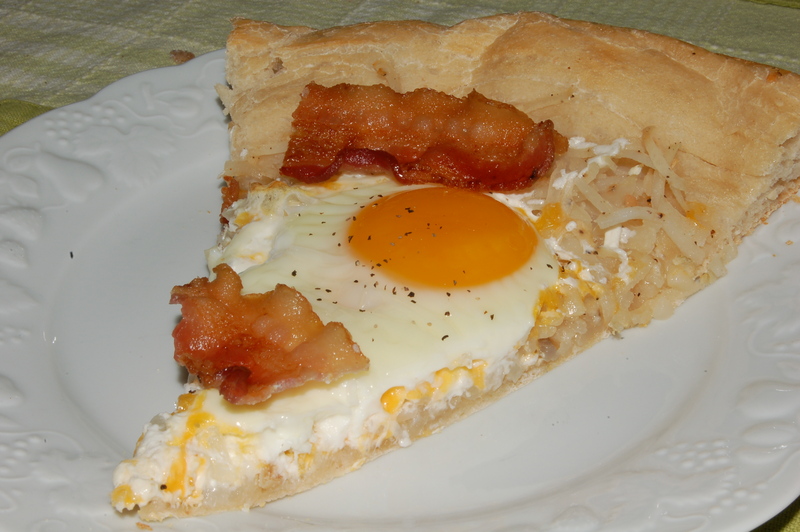 And there you have it, breakfast pizza. But it doesn’t need to be eaten just for breakfast. It makes a very good brinner (breakfast for dinner) as well. It would also be perfect for breakfast in bed since you’d only need one plate, and there’s very little crumbs, and nothing to spill. The main downfall of this pizza is that it doesn’t really save/reheat great, mainly because of the egg. So try to finish it all in one sitting if possible. Which shouldn’t be difficult since it’s yummy. It’s all the breakfast flavors in one place/bite. But it’s yummy, so that shouldn’t be too much of a problem. If you ever can’t decide what to make for breakfast or brunch, you can just make this since it’s all the things. Posted on May 26, 2015, in Pizza Lab and tagged bacon, breakfast, cheese, crazy crossovers, eggs, Pizza, potatoes. Bookmark the permalink. Leave a comment.